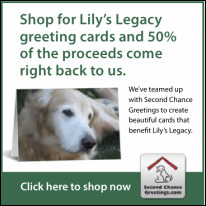 Lily's Legacy Senior Dog Sanctuary is entirely supported by contributions from generous and compassionate dog lovers. Your generous donations enable us to pay for veterinary care - our biggest expense - food, and other dog supplies and care, program expenses, sanctuary improvements and maintenance. 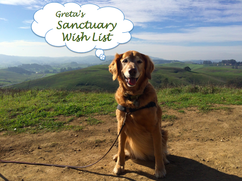 This special place for senior dogs is only possible with gifts like yours. Please make your tax deductible donation today!​ Help us keep the tummies full and tails wagging! Make a secure ONE-TIME donation OR become a “Lily’s Legacy Angel” with an automatic MONTHLY donation of $10 or more. NOTE: To make a one-time donation, fill in the Contribution Amount box you'll see when you click the blue donate button below. Here's a great idea to inspire you! Lisa Matheson is not only an invaluable Lily’s volunteer, she is also a realtor at Coldwell Banker in Petaluma. Lisa is donating $250 from every residential real estate transaction to Lily's Legacy! Thank you Lisa, we are so grateful! If you would like to make a donation through a transfer of stock, please call us at (707) 787-7010 for the transfer instructions into our Lily's Legacy account at Vanguard. A free, convenient service for converting that extra car, truck, or RV into a tax deductible donation benefiting Lily's Legacy Senior Dog Sanctuary. You can donate online or call 877-999-8322 to make your donation. Amazon Smile is a simple and automatic way for you to support your favorite charitable organization every time you shop, at no cost to you. Simply go to smile.amazon.com with your Amazon account and search for Lily's Legacy to make your shopping count for our four-legged friends. At Amazon Smile, you’ll find the exact same low prices, vast selection and convenient shopping experience as Amazon.com, with the added bonus that Amazon will donate a portion of the purchase price to your favorite charitable organization. Lily's Legacy gets money every time you purchase online from wide variety of stores through iGive. Sample DogTrekker's free online newsletter and $1 goes to Lily's Legacy, even if you cancel.